The first step in our insulation process was to use the froth pack from Dow Chemical to seal where the OSB meets the studs to eliminate air and insect penetration. We used it to seal around electrical boxes. All Dow foams are fire retardant but the orange is dyed for instant identification for inspectors. 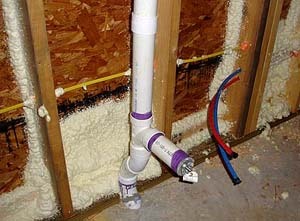 Extra insulation was sprayed behind plumbing pipes on exterior walls to reduce the risk of freezing. The next step was the blown in insulation. 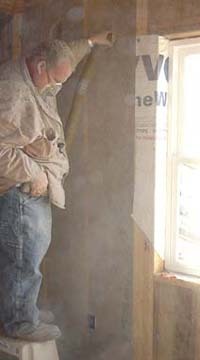 Since it is winter time, it would have required several weeks for wet blown-in insulation to dry thoroughly to avoid mold issues before installing sheetrock. 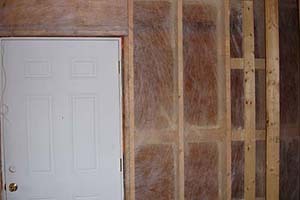 Therefore, Carolina Insulation recommended we use Blown-In Dry Pack Cellulose insulation. First they applied a netting along all the exterior walls to hold the insulation in place, and then using a tube pumped the dry pack cellulose into the spaces. 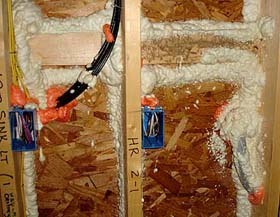 Blown-in cellulose insulation is non-toxic and extremely energy efficient with an R rating of 3.5-4.0/inch. This dry cellulose is made primarily from recycled materials treated with a fire retardant as well as boric acid to deter insects. Code requires R-15 in walls, but these insulation techniques combined with the brick, and ¾" sheetrock is giving us an 11 ½" exterior wall, for an R-Value of R-19.5-R.22 just in insulation, this doesn't count the added thermal dynamics due to the froth pack sealing out drafts along with the superior draft control of cellulose. Blown-in Cellulose Insulation- Tommy Davidson, Carolina Insulation & Foam, Inc. Installation - Harrelson's Home Improvement Company.